The Foundation’s mission is supported by a Governing Board of Directors and an Advisory Board of professionals, many of whom have dedicated their careers to improving the clinical treatment of incontinence and advancing medical science through bladder and bowel research. Financially, the Foundation is sustained through educational grants, corporate contributions, sales of educational materials, and donations from individuals. The Simon Foundation is known throughout the world for its innovative educational projects and tireless efforts on behalf of people with loss of bladder and bowel control. Simon has led the way forward with many groundbreaking projects, for example: the first book written for laypersons, “Managing Incontinence: A Guide to Living with the Loss of Bladder Control”; an educational/support group, “I Will Manage”; the first television movie on incontinence, “The Solution Starts with You”; conferences on little explored, but impactful subjects such as – the first International Conference on Prevention of Incontinence (London, England 1997) and the first International Conference and Town Meeting on Stigma in Healthcare (Chicago 2003); the Defeating Stigma in Healthcare Campaign, and the Innovating for Continence conference series, to name just a few. View our historical timeline for a more complete listing of activities and accomplishments. Cheryl B. Gartley, President and Founder of the Simon Foundation for Continence, addressing attendees at the April 2009 Innovating for Continence Conference in Chicago, Illinois, regarding the stigma associated with incontinence. 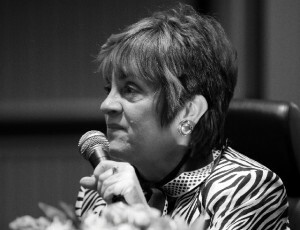 The Foundation’s President and Founder, Cheryl B. Gartley, was the first person with incontinence to speak publicly about loss of bladder control. She has promoted continence with keynote speeches and interviews on prime time television in England, Germany, France, Japan, Italy, Australia, New Zealand and throughout the United States and Canada. The Foundation’s Vice President is Elizabeth A. LaGro. The Director of Special Events is Twila Yednock and the Foundation’s Manager of Special Projects is Susan Hayward. Who Is the Simon in the Simon Foundation for Continence? 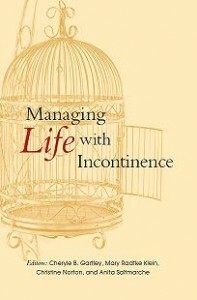 Reprinted with permission from Managing Incontinence: A Guide to Living with Loss of Bladder Control, edited by Cheryl B. Gartley. Eventually, wherever I speak someone will ask me what Simon stands for. It is a question I love to answer and this book would not be complete without your knowing too. Simon was my grandfather, and although in many ways an ordinary man, he was very special. He had a belief that was central to his life. He believed that in this country anything was possible. Crawling across the border of his own beloved country, Latvia, at risk to his life, he made his way to this country with only the shirt on his back. A tailor by trade, he opened a small business, which supported his wife and four children, and which eventually enabled him to purchase even an automobile. He died when I was twenty-one, but the tapes of our conversations still play in my memory. When I got my first pair of real shoes, Capizzio’s no less, grandpa said, “In this country, they look great on you.” In Italy would they have looked terrible? When I became a fairly proficient clarinetist and grandfather would hear my newest piece, he would respond, “In this country, you will make a terrific professional musician.” Anywhere else I would have sounded like an amateur, no doubt. When the tragedy of braces on my teeth befell me at age eighteen, grandpa thought they were beautiful, because, of course, where else but in America could the dentists perform such miracles! The Simon Foundation is named after this man, to challenge everyone who believes as he did – those who see a wrong and believe it can be made right – and to motivate a granddaughter.